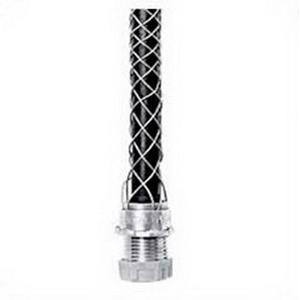 Hubbell-Wiring Kellems® Dust-tight strain relief grip with insulating bushing with NPS connection, accommodates conductor of size 0.54 - 0.73-Inch. It has trade size of 3/4-Inch. It has 6-1/2-Inch galvanized steel mesh, aluminum body/sleeve, steel locknut and plastic bushing. Strain relief grip has 1-1/2-Inch minimum space between grips. It has operating temperature rating of -34 to 107 deg C. Strain relief grip is UL listed and CSA certified.